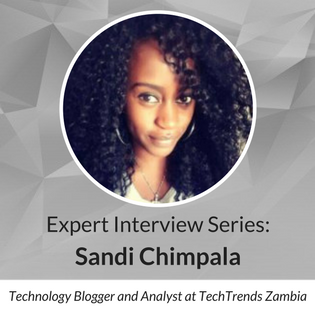 Sandi Chimpala is a tech enthusiast and blogger for Techtrends Zambia, where she never shuts up about technology’s opportunity for the developing world. Tell us about the mission behind TechTrends. How are you hoping to help your audience? Techtrends Zambia was started to have conversations around technology, its innovations locally and its value to the development of the emerging economy that Zambia is. It is also a platform to showcase some of the latest technology being made outside the country that make their way in, and review them for potential consumers so they fully know whether it’s worth their buck before they decide to purchase it. What are the major tech trends you’re following in Zambia today? Why do they interest you? I follow mostly mobile innovations and digital media progress because mobile is the biggest platform for most innovation in Zambia, and digital media the means by which many respond to information or express feedback on technological subjects. I follow those two trends also for the high interest in them by readers of the blog, and it’s great to know we are thought leaders on these topics. Another trend I follow is products by mobile operators in the country. They are important because a mobile phone is a basic need of almost anyone and it’s mandatory that large corporations like telcos are not ripping consumers off of the services and products that they really need or that are worth the price they set them at. What IT trends or milestones have made the biggest impact on Zambia in recent years? What has spurred innovation most effectively? The increased use of mobile data leading to a higher number of people joining social media platforms to find stories or express their opinion. The use of mobile data has also been facilitated by mobile operators creating data bundles to fit all types of pockets. The increasing use of mobile money to pay for goods/services (even though it has yet to become the absolute form of e-payment due to digital illiteracy in many areas). This has, however, made providers of goods/services and IT innovators integrate the mobile money aspect as they develop their systems. The high number of technopreneurs springing up to provide products/services that can be accessed via mobile phones. This innovation has been spurred on by the fast-paced life most people are living, requiring faster ways to do things, as well as the increase in mobile device usage in the country. What businesses have you been following for how they’re embracing different types of digital technology? What can other business owners learn from them? One example of a business that has embraced digital technology in its operations is the Road Transport and Safety Agency (RTSA) in Zambia. Before, all their records were stored as files but now they are integrating motorist data into a virtual system so a driver can access services like licence replacements or complete applications anywhere RTSA has an office in the country. Other businesses, especially in the public sector can learn the importance of digitalization’s ease of work when it comes to operations. Tell us about how cloud computing has benefited businesses in areas of the world like Zambia? What has been the impact of the Cloud? First, we get to say goodbye to tedious paperwork stored in files in a backroom and hello to efficiency! Workloads are reduced as businesses can get data about users or services at the click of a button. For security reasons, cloud computing is providing assurance to many institutions through data encryption options, especially banking ones, that may experience threats like hacking or network shutdowns, and loss of data about their clients/users. It has also allowed many business owners/employees to work remotely with data that is updated in real time. What are the common IT frustrations you hear from Zambia (or other regionally based) businesses? How can those frustrations be addressed? Lack of technical support from overseas manufacturers that leaves developing countries behind in terms of updates. Investments need to be made in modern technology by governments for public institutions, manufacturers need to get data from developing regions for how the technology works best there and provide suitable options. Digital skills and/or literacy should be made a compulsory part of education from an early age, and the trainers must be up to date on the latest technology because they are the ones passing on this information to students. What excites you about the speed of innovation in Zambia and around the region right now? The various players coming together to partner on providing a service that benefits communities, the local tech hub becoming an innovation hub to cater to all sorts of business ideas that depend on tech to run, the government implementing e-services in some departments to speed up service delivery. There is also a growing dissatisfaction from consumers expressing frustration with older systems, forcing service providers to develop faster alternatives to counter this dissatisfaction. Competition is increasing and that results in better innovations for all. In what areas of IT and/or innovation would you like to see more of an emphasis where you are? Why? Service delivery– only because the entire wealth of a country depends on how well people are living in it. Innovations in IT have the capacity to foster that goal by ensuring that the system can have data on every aspect of the country where people’s needs have to be met, and provide efficient means of communication where they fall short to ensure that no one gets left behind.